This example uses the Configurable Logic Cell (CLC) to create a combinational logic to wake up the CPU. The following logic is generated to achieve the wake-up condition. 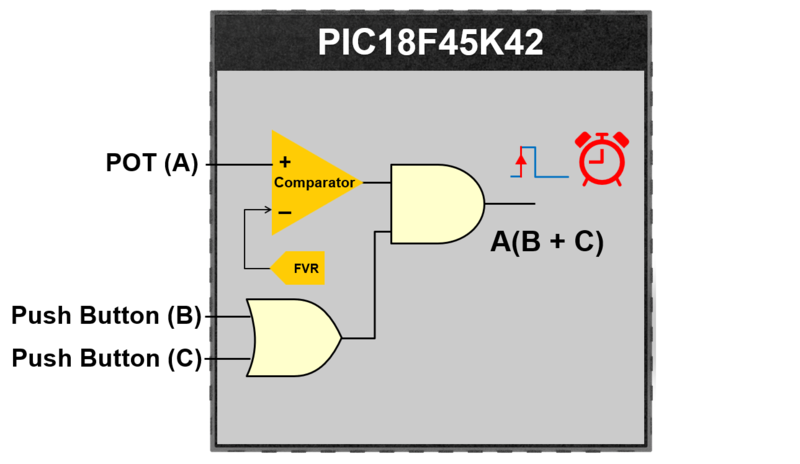 Therefore, only when the POT voltage level is higher than the Fix Voltage Reference (FVR), and either of the pushbuttons are pushed, the CPU will be waken by the CLC interrupt. When the wake-up condition is achieved, the LED will light up for a while and the CPU will go back to Sleep Mode afterwards. This example is demonstrated in the livestream "Think Outside the CPU: MCU Signal Processing Without Using the Core". Check out the livestream for more information.